What started as an ordinary day in El Paso for medical student Jeff Scott a couple of years ago quickly turned frantic when a neighbor started shouting for help. 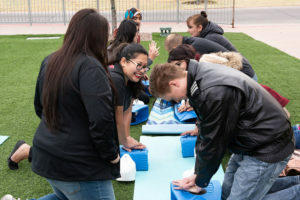 Students from the Paul L. Foster School of Medicine taught hands-only CPR to El Pasoans as part of the nationwide Texas Two Step: Save a Life campaign. Scott was among several medical students who helped teach those crucial steps – calling 911 and initiating hands-only CPR – at free, five-minute training sessions at two locations around El Paso on Saturday, Feb. 9. The lessons were part of the nationwide Texas Two Step: Save a Life campaign, an annual event aimed at teaching the public about compressions-only CPR. This is the second time in three years Scott has participated in the program. Learn more about the Texas Two-Step: Save a Life Campaign at www.tx2stepcpr.com.